The first yacht fitted with MTU (2 x 16V Series 4000 M73 engines + 2 x SCR systems) is currently under construction at the Istanbul-based Bilgin Yachts shipyard. The 80-metre long megayacht is scheduled to be commissioned in mid-2019. Die erste Yacht mit IMO-III-Antrieb von MTU (2 x 16V 4000 M73 + 2 x SCR-System) ist derzeit im Bau bei der Istanbuler Werft Bilgin Yachts. Die 80 Meter lange Megayacht wird Mitte 2019 in Betrieb genommen. 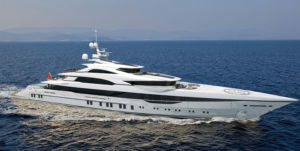 The first yacht fitted with MTU Series 4000 engines is in build at Bilgin Yachts shipyard. The latest generation of Rolls-Royce MTU’s Series 4000 engines equipped with the SCR system for ships has successfully completed the IMO Tier III certification tests. Representatives of the ABS, BV, DNVGL, KR, NK, LR and RS certification bodies initially tested the 20-cylinder version, which was awarded approval as being representative of the remaining versions. This means that the engines now comply with the emission regulations in accordance with IMO MARPOL Annex VI, IMO Tier III. For yachts and patrol boats, the engines are currently available from MTU as 12, 16 and 20-cylinder versions for a power range extending from 2,160 to 3,900 kW. The first yacht to be fitted with an IMO Tier III propulsion system from MTU (2 x 16V Series 4000 M73 engines + 2 x SCR systems) is currently under construction at the Istanbul-based Bilgin Yachts shipyard. The 80-metre megayacht is scheduled to be commissioned in mid-2019. For workboats such as tugboats and ferries, MTU will gradually be introducing the engines complying with IMO Tier III and EPA Tier 4 emission regulations onto the market as 12, 16 and 20-cylinder versions covering a power range from 1,119 to 3,220 kW. The workboat engines will thus offer a 45 percent increase in output compared with the predecessor versions and will thus be the only high-speed workboat engines delivering an output of up to 3,220 kW. In addition to power ships output and environmental compatibility, life-cycle costs were also a key focus during the development of the new MTU engines, the aim of which was to create significant benefits for ship owner/operators. As a result of improving the operating efficiency of the turbocharger, it was also possible to reduce fuel consumption by a further 5 percent compared with the predecessor model. MTU has already delivered the first EPA Tier 4 propulsion systems for new catamarans operated by the WETA (Water Emergency Transportation Agency) in California. MTU’s new integrated system consisting of the propulsion system and SCR exhaust gas aftertreatment system is requiring a minimum of space. It is designed for flexible installation and features an excellent power-to-weight ratio. The customer can switch between modes (IMO II and IMO III) during operation, in order to comply with the emission requirements of the region in which the yacht is sailing. MTU’s SCR system is fully controlled, with real-time NOx measurement both upstream and downstream of the SCR system. This ensures that the precise amount of reactant is introduced regardless of the conditions. Besides the IMO Tier III-certified engines, MTU will continue to offer IMO Tier II engines.